Concrete and terrazzo surfaces are durable, long-lasting, and practical for residential and commercial buildings alike. 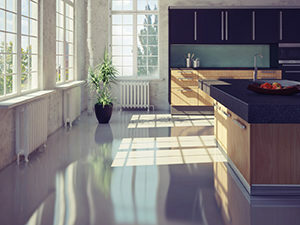 Unfortunately, improper cleaning, topical coatings and waxing, and plain old wear and tear can diminish their attractiveness and a constant strip and re-application of coatings cycle can put a strain on the budget. Clean Sweep can finish these surfaces using processes which do not require toxic chemicals or topical coatings, making your terrazzo and concrete beautiful and significantly reducing maintenance costs. More and more businesses, industrial sites, and even homeowners are discovering the cost effective and attractive solutions polished concrete represents. We are more than happy to speak with you about the ways professional concrete polishing can benefit you. 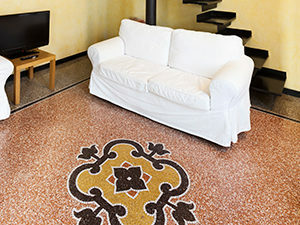 Terrazzo floors are often coated to give them a shine, but they can actually be polished with the same methods as natural stone for a beautiful, durable finish without this process? We can help you save on maintenance costs without skimping on appearance.